Even if something looks perfect it may well already be outdated. 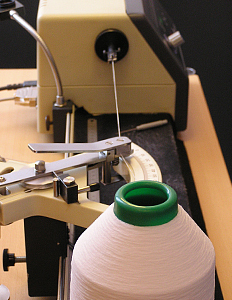 For this reason, our yarns are constantly subjected to tests and quality controls in our own laboratories. Yarns are checked in view of product requirements such as composition, stress-strain performance, breaking strength and turns per meter. Our prime objective is to achieve the defined quality levels in all areas and production steps. It is our firm conviction that no compromises in terms of quality will be allowed. The basis for this pledge was the implementation of a quality management system and the following certification according to EN ISO 9001:2008. The principle of top quality likewise applies to the selection of our raw materials since the manufacture of superior finished products is only possible if the materials used at the start are in perfect condition. With the Oeko-Tex standard 100 for the product category I and II, respectively, it is ensured that the yarns we use comply with the currently applicable human-ecological requirements. First-class materials, fastidious processing and constant checks guarantee consistent yarn quality in the long term and thus satisfaction of our valued customer.